Not long ago, Mayank Agarwal was scoring a mountain of runs in domestic cricket and 'A' level but he was still like a lost star where his stars refused to align. It was frustrating for Mayank as he didn't get an opportunity despite scoring consistently. However, he was included in 2-match series against West Indies at home but he didn't get a match to play and later was dropped for the Australia tour. But Karma had other plans, the Karnataka batsman was drafted into the squad after the first two Tests as Prithvi Shaw's injury in practice match came as a blessing for him. He straightway included into playing XI for Boxing Day Test in Melbourne and he didn't let this opportunity go with a well-compiled 76-runs on bouncy MCG pitch. 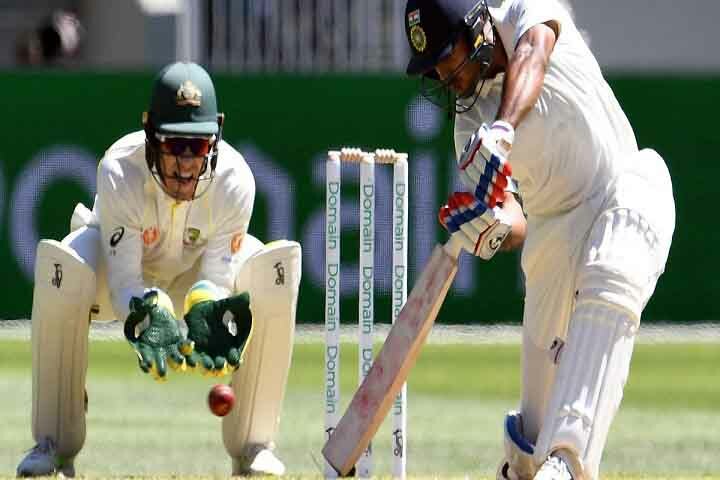 That inning was enough for him to grown his confidence as he played a crucial 42-runs knock in the second innings in between the fall of wickets at the other end. Mayank missed out on converting two half-centuries into hundreds but finished his three-innings series with an impressive 195 runs (76, 42, 77). After coming back to India, he was happy while giving an exclusive interview to TOI and spoke about the trip. What were your thoughts when you touched down in Australia? I was just excited to be a part of the Indian team. I was going to be part of a series which was being intensely fought and was interestingly poised at one-all, and I was looking forward to being there. Getting the cap was nice but the thing that struck me the most at that moment was the encouraging words I received from Virat (Kohli) and everyone around. A couple of days before my debut, Ravi (Shastri) sir spoke to me and said, 'Mayank, you will get your chance. We know you have come up the hard way; you've scored the runs and those things will really help you when you play'. Virat too was very encouraging and said, 'It is a big place to make your Test debut. Bigger the place, bigger the opportunity and greater chance of an impact you can make'. It felt fantastic to be accepted and supported by everyone. How reassuring was it to have your good friend and statemate KL Rahul in the squad? We've played a lot of cricket together. It was very comforting to have one of my best friends on the side. He made sure I was comfortable. Obviously, having your best mate meant the vibes and energy levels were high. Once there, we both went out for coffee and he sat me down and spoke to me. I asked him about the Aussie bowlers. He told me about his experience and what he made of it. I was watching the matches, but getting first-hand information from my best mate, who was playing in the series, was also nice and that really helped. The 76 on debut, how did that feel? To be honest, I was nervous at the start. Once I got two-three shots away and got going, then I just got into the zone. It was just me, talking to myself and saying, 'I've come here with a plan and I'm going to stick to it.' I just tried to be in the moment and not think about anything else. Did you thrive on self-belief? Probably. Also, it is the confidence that came from the fact that I had got a lot of runs before (going to Australia). Also, I prepared well for the match. At practice, Sanjay (Bangar) sir and I made a few notes about what the spinners and pacers would look to do. With everyone rallying around me, I was in a good space. Which according to you was your best innings in Australia? Honestly, I don't like to compare. I wouldn't say this was better or that was good. I thought each innings had different importance to it. Any regrets on missing out on a century? I wasn't very disappointed when I got out in the first match (at 76) because I thought that Pat Cummins delivery kicked more than I expected. But in Sydney, I was upset with myself. It wasn't about a hundred, but I could have got a bigger score. I was disappointed at the way I threw my wicket away. That said, I also had a plan on how I was going to play and pace my innings. The plan was to attack Nathan Lyon and that did not work out. If there is a lesson from it and I can improve myself as a player, then it is a lesson well learnt. What was your biggest takeaway from the series? A lot of confidence and the experience of playing international cricket. During the tour, I understood what it takes to be there and perform. How did it feel to hold the trophy? I can't put down the feeling in words... it was indescribable. The one thing I can say is that people often told me, Test cricket is the ultimate form of cricket and I have experienced it. With the Test debut done, are you looking at the limited-overs breakthrough now? Like I have always said, every person's journey is different. I've made it to the Test team and I'm grateful for that. What's got me this far is sticking to the process, hard work and playing every game to the best of my ability. I will take whatever comes out of it. I'm not thinking too much ahead. I'm just going to take things as they come. When the time is right, that (limited-overs debut) too will happen.